Whether we like it or not, the simple fact of the matter is that our water contains a number of impurities which lessen its overall quality. Fortunately, we can remove these impurities through the use of water conditioning systems. Different conditioning systems are capable of removing different types of impurities. However, there is one conditioning system that can remove more impurities than the others: the reverse osmosis system. This isn’t to say that a reverse osmosis system is perfect, however. Before you decided to have one installed, it’s important that you gain a deep understanding of what they can and can’t do for your water. Read on to decide on whether or not you should utilize a reverse osmosis system in Kildeer. 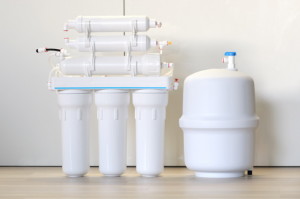 To understand how a reverse osmosis system can benefit you, it’s important to first gain an understanding as to how a reverse osmosis system works. These systems utilize a variety of sophisticated filters in order to rid water of even the smallest of contaminants. First, unpurified water goes through the pre-filtration process. In this stage of reverse osmosis, water cycles through a filter known as a sediment filter. This filter will remove all large contaminants, from stones, to sand, to any other contaminants visible to the naked eye. After water has been pre-filtered, it moves on to the membrane portion of the reverse osmosis system. The membrane is the most effective component in the system, removing any microscopic contaminants such as radium, chlorine, sodium, and lead. Lastly, the water moves to the post-filtration stage. During this stage, the reverse osmosis system will utilize a carbon filter to remove any microscopic contaminants which were not caught by the membrane. Once the water has passed through the post-filtration stage, it is held in a storage container. With the use of a faucet, it can then be poured and consumed. Why Should You Utilize a Reverse Osmosis System? Most people use reverse osmosis systems to enjoy water in its purest possible form. These filtration systems remove more contaminants than any other type of water conditioning system you’re going to find. Water that has been conditioned by a reverse osmosis system will not only be void of unsavory tastes, but disgusting smells as well. In essence, it is the ultimate drinking water. Great for both cooking and drinking purposes, it goes down smooth and carries no major side-effects. There are a few potential downsides to reverse osmosis systems. One is that they’re typically not capable of conditioning a building’s entire water supply. They are not able to work fast enough to condition water for showering, dishwashing, and clothes washing purposes. These tasks would require a different type of water conditioner. One thing to keep in mind with reverse osmosis systems is that they will remove some minerals from your water that are good for your health. Necessary minerals such as calcium and magnesium will be removed from your water, necessitating that you find them in other foods. Interested in Installing a Reverse Osmosis System in Kildeer? Are you interested in installing a reverse osmosis system in Kildeer, Illinois? If so, we here at Johnson Water Conditioning are the people to see. We manufacture, service, and install reverse osmosis systems to accommodate water supplies of all different sizes. Our team of water conditioning specialists looks forward to working with you. For decades, the residents and businesses of Kildeer have turned to Johnson Water Conditioning for water solutions. We provide free consultations designed to better identify the type of water softening solution that best fits your needs.